Who says slides are dead? Not the students in Marc Ganzglass’ Sculpture I class, who have been visiting the Visual Resources Center this semester to explore the slide collection. Each week, two students pull 80 slides (a full carousel tray) and project the images side by side for a Friday morning “slide slam” which serves as visual inspiration for the class. Although most VRC patrons primarily use our digital collections, it’s been great to see the analog collection getting so much use. The Bard slide collection represents over 30 years of collecting and remains an incredible resource for images. Working in a physical collection has been an eye opener for many students who are used to searching for images online, where a finely tuned keyword search can bring up hundreds of related images. 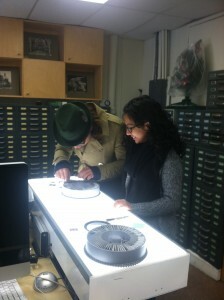 In the slide collection, students must determine how an image might have been filed within the confines of a predetermined organization system. Image catalogers have long been familiar with the unique challenges slides present. Because an image can be approached from many subject paths, deciding where a slide would ultimately reside in a collection was often a very subjective business. Should this in-situ fresco be placed in the architecture section with other images of the building, or filed with paintings by the same artist? What if the fresco was removed and now resides in a museum? Where do views of the Chicago World’s Fair go? Do we keep them together or should each building be filed under the name of the architect who designed it? What if the view shows more than one building? The digital revolution has of course dramatically changed the tools we use to find and present images. Certainly one of the greatest improvements is increased access. In the past, students would need to come to the Slide Library to review the images presented in class; now they can view images anytime and from anywhere by accessing our online collections. There is no longer only one copy of image, and at least most of the time, digital images don’t get lost, broken or turn pink. We do miss the foot traffic though. It’s been great to hear the exclamations from students when a really amazing image is found. I’m sure the same joy is felt when something is found in our digital collections, but we’re not there to hear it.